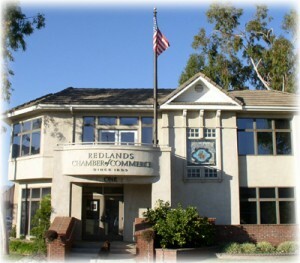 The Redlands Chamber of Commerce prepares an annual report which includes a review of the prior year’s activities, events, and accomplishments. The report is published for the benefit of its members and general public as a review of the progress made over the past year to advance the future visioning the Redlands’ business community. We are pleased to present the following as a summary of the Chamber’s progress toward strategic objectives during 2014. A member of the Government Review Committee sits on the City and Climate Action Task Force to effectively review the Community Sustainability Plan insuring the best interest of the business. Chamber staff serves on the on Senator Mike Morrell’s Small Business Advisory Council. The Chamber supported the City’s Alcohol Deemed Approved Ordinance, that provides an additional tool for the police department when overseeing businesses, new and old, that serve alcohol and the resulting behaviors. The Chamber has worked with the Redlands Conservancy on a marketing campaign to reach out to the development community interested in restoring and adaptively reusing commercial buildings, enhancing the current makeup of the existing inventory in Redlands, the result was a brochure that shows the kinds of opportunities available when locating and adapting buildings in downtown and historic areas. The Chamber continues the role of information disseminator as the Affordable Care Act became a reality in 2014, keeping members informed about the program, the California Exchange Market Place, and the numerous changes that have taken place over the course of the launch. The Chamber led the regional campaign opposing AB 2416, a bill that would create a new super-lien that would allow employees, governmental agencies or anyone authorized on behalf of the employee to file liens on an employer’s real or personal property, and/or property where work was performed, based on alleged-yet-unproven wage claims. A lien could be placed on an employer’s property and on the property where the work was done, in an effort to collect unresolved wage disputes. Residential remodel, tenant improvements, landscaping or custom home construction, delivery, service and more could have placed you in jeopardy of being woven into a wage dispute and consequently create a financial nightmare for you. The bill failed. The Chamber again took a position and rallied the effected non-profit organizations alerting them that the City Council would be again discussing the possibility of doing away with waiving “hard cost” fees for special events presented by local non-profit organizations. After serving as a conduit to the businesses in the Orange Street Plaza and the Redlands Police Department and developing a model for communication the Chamber continued to connect businesses and police throughout the city to discuss pressing issues; including pan handling, the civil rights of the homeless population, public services available, and proactive partnerships in crime prevention. The Chamber continues to work closely with lawyers and legislators to continue to stop the abusive attack on small business owners using the Americans with Disabilities Act and Unruh Civil Rights Act. After SB 1186 was past a new wave of offensive law suits have now surfaced and are plaguing our small businesses so further correction is needed. We are in the process of creating an information resource brochure that we hope to work with the City to include in all business license invoices, alerting the business community to the lawsuit attacks and what they might be able to do to prevent them. The Chamber Government Review Committee continues to monitor recently introduced Assembly Bills 52 and 54 advocating ADA reform to decrease the frivolous ADA law suits continuing to plague California. The Chamber provided a member to sit on the Redlands “Parklett Pilot Program”. The Chamber presented a live televised City Council Candidates Forum, offering insight into seven candidates vying for three seats. The Chamber is represented on a committee focusing on tourism that is establishing cross marketing efforts and casting an ever widening net to encourage visitors to Redlands. The Chamber sits on the Redlands Charitable Resource Committee, serving as a business representative to that organization. Offering a discounted Workers Comp Insurance Program that will allow Agents to offer a discount to Chamber members when shopping for Workers Comp insurance to qualifying businesses. “Extraordinary Benefits for Distinguished Members”. The Chamber identified and celebrated three “Top Chamber Businesses” in conjunction with Senator Mike Morrell’s office at the annual event held in November. Hosted the State of the Community Luncheon sponsored The Gas Co. The Chamber along with the Rochford Foundation, presented for the first time ever in downtown Redlands, Redlands on Ice, a synthetic ice rink that brought hundreds of fun seekers to downtown to enjoy the sights and sounds of ice skating in Redlands. Sponsored by The City of Redlands, Circa 2020 and Inland Presort and Mailing Services. Presented the second annual Redlands Chamber Night Light Run, sponsored by, Barich and Associates, Beaver Medical Group, Juice it Up, Redlands Fitness Training , Arthur Murray Dance Studio, JAMS Sportswear, and Redlands Blueprint and Commercial Press and Southern California Edison. Produced a Holiday Shopping Guide distributed to all racers and skaters and delivered throughout the region. Redesigned the Chamber e-newsletter, through new delivery system that can now analyze data, from accessing areas of interest, the number of “clicks” on each article, who opened the email etc. Introduced Wednesday morning member E-Blasts an opportunity for our members to E-Blast their message through the Chamber (Sold out).